My kids started school last week so I have been on the hunt for easy flexible meals that will work on nights when we have everyone coming and going and eating at different times. These steak and quinoa bowls have been a great discovery. You can prepare the components ahead of time and let everyone make up their own bowls when they’re ready. The concept of “meals in a bowl” has been popular for awhile so I am definitely late to join the party but that’s pretty normal for me. A trendsetter – I am not. But I’m finally here and I’m all in. Honestly, meal bowls are perfect. They’re adaptable to all different tastes and they’ve got your proteins, grains, and veggies all together. Options are endless and I am sure to experiment with other combinations but right now I’m loving this combination of chimichurri steak, sautéed vegetables, and quinoa drizzled with some ponzu sauce to tie it all together. To cut down on prep time, raid the salad bar at your grocery store. You won’t have to worry about washing and cutting the bell peppers, corn, or spinach. The salad bar at my favorite grocery store even offers roasted corn which is perfect for this recipe. Except for the chimichurri sauce, there’s no need to get hung up on exact measurements for the vegetables in the quinoa bowls. Go with whatever you’re in the mood for. After all, this meal is all about being flexible. Place the parsley, garlic, olive oil and vinegar in a food processor and pulse until well chopped, but not puréed, scraping down the sides of the bowl as necessary. Set aside. Generously season both sides of the steak with salt and pepper. Then rub each side with about 1 tablespoon of chimichurri sauce. Heat the oil in a large, heavy duty cast iron skillet over high heat until almost smoking. Add the steak and cook, turning once, 4 to 5 minutes per side for medium-rare, or until done to your liking. Transfer the steak to a cutting board and spread 2 tablespoons of chimichurri sauce on the steak. Cover steak with foil and let rest for 10 minutes while preparing the vegetables for the quinoa bowls. In the same pan used to sear the steak, add 1 teaspoon olive oil and heat over medium-high heat until oil begins to shimmer. Add the corn. Sauté corn, scraping up any brown bits from the pan, until it is warmed through. Season to taste with salt and pepper. Transfer corn to a plate. If pan is dry, add another teaspoon of olive oil. Add bell peppers and cook until they are tender-crisp. Season to taste with salt and pepper. Transfer bell peppers to same plate as corn. To the pan, add the spinach. Sauté spinach until it is wilted. Add 1-3 teaspoons of water to the pan and cover if necessary to help the spinach wilt. Slice the steak against the grain into thin slices and then into bite-sized pieces. 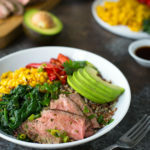 To serve, fill bowls with desired amounts of quinoa, steak, corn, bell peppers, spinach, and avocado. Drizzle desired amount of ponzu sauce on top, and serve with a sprinkle of fresh cilantro leaves. Use fresh corn kernels if you can but frozen corn will be fine too. Refer to my recipe for Citrus Quinoa Salad for an easy way to cook quinoa. Recipe adapted from Food and Wine, Aug/Sept 2016. Chimichurri Sauce recipe adapted from Chef Michael Cordua.